Proof that there’s still room for another World War II flick. 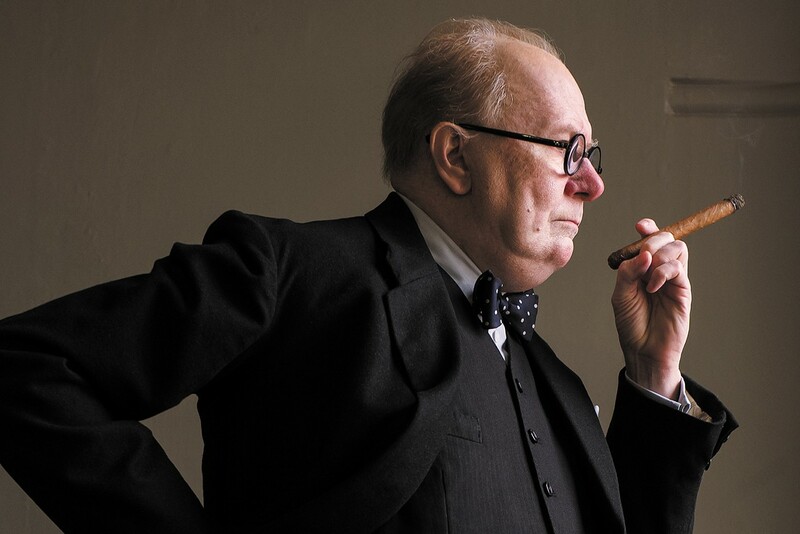 Gary Oldman disappears into Winston Churchill in Darkest Hour. Here we are in December, with award-seeking movies flooding into theaters at an alarming rate. One of the more conspicuous is Joe Wright's Darkest Hour, the latest (maybe the last?) World War II flick released in 2017, to regale the nation's multiplex audiences with tales of a war, long ago and far away, that many moviegoers know nothing about. We won, the Nazis lost, and a large number of brave men and women distinguished themselves in the fight against fascism. Conspicuous among them was British Prime Minister Winston Churchill. If you had seen Gary Oldman in any of his recent films — The Space Between Us or Dawn of the Planet of the Apes — you'd probably be shocked at his transformation into the character of Churchill, at age 66 a roly-poly, jowly, cigar-chomping, back bench Tory politician who notoriously refuses to eat a meal without wine and whiskey. Is this really the actor who portrayed Sid Vicious, Joe Orton, Dylan Thomas, Count Dracula, Ludwig van Beethoven, Pontius Pilate, Lee Harvey Oswald, Sirius Black, and John le Carré's crafty spy Smiley? In 1940, many leading Britons, including upper-class twits King George VI (Ben Mendelsohn) and Viscount Halifax (Stephen Dillane), seem inclined to sue for peace with "that corporal" (Hitler) after the blitzkrieg overruns Europe, but the pugnacious Churchill and his wife, Clementine (Kristin Scott Thomas), are having none of that. Director Wright, a renowned maker of Oscar bait (Atonement, Pride and Prejudice), coats the action in the hazy ochre tint that spells H-I-S-T-O-R-Y, but it's Winnie we want. Cue the probably apocryphal scene in which Churchill descends into the Tube at rush hour to suss out war strategy and crack jokes with a carful of ordinary Londoners. The people speak: "Beat the buggers!" And so they went ahead and did it. Almost all doubts about this film vanish at that moment. "Churchill mobilized the English language and sent it into battle," indeed. Never surrender! And please pass the popcorn.